The Union is a brig, a two-masted square-rigger. These ships were much in use during the 18th and 19th century as merchant ships and light warships and served very well in coastal patrols and for short journey. Many were privateers: Merchant ships which were armed and equipped as vessels of war, and furnished with government commissions to cruise against and annoy the enemy by taking, sinking or burning their ships. 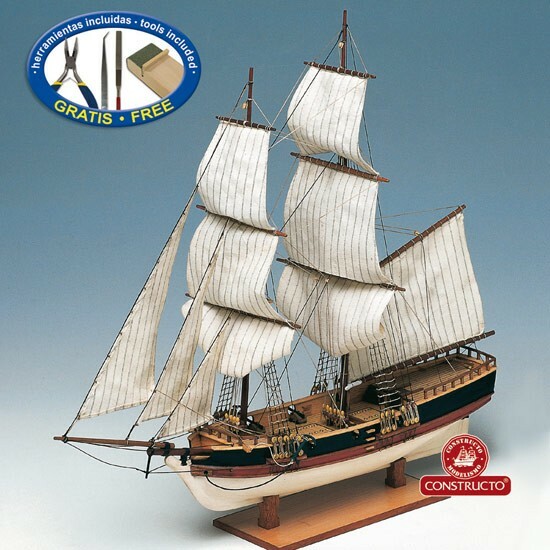 Easy to build pre-carved solid hull kit includes instruction, parts, paints, tools, glue, and brush.